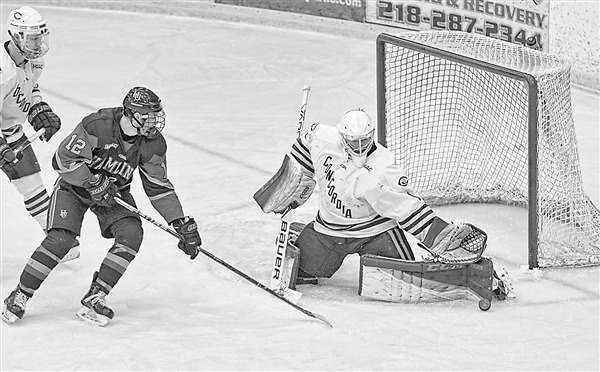 Jacob Stephan stares down an opponent after making a save in a Minnesota Intercollegiate Athletic Conference game. Northland Pines graduate and former Eagles hockey standout Jacob Stephan recently completed his junior season as goalie for the Concordia College Cobbers in Moorhead, Minn.
After leaving Northland Pines, Stephan spent two seasons with the Great Falls Americans, a Juniors program that competed in the North American 3 Hockey League (NA3HL), one of two USA Hockey-sanctioned Tier III Junior leagues. 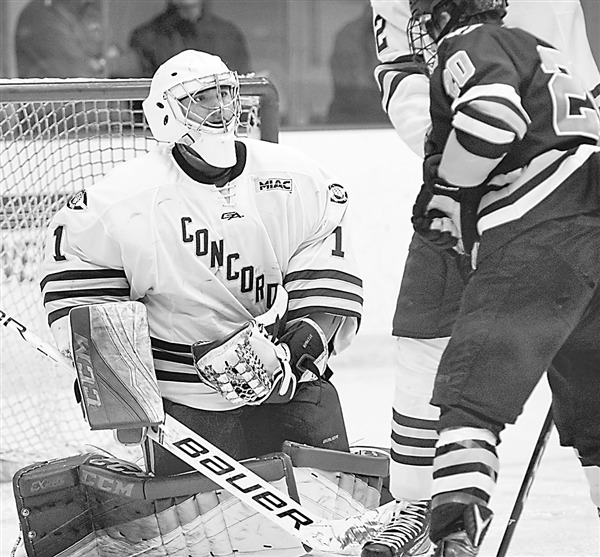 After leaving Great Falls, Stephan enrolled in classes at Concordia and immediately made an impact on the hockey team, according to his coach, stepping into a starting role late last season and posting a 6-7-2 overall record as a sophomore. Stephan greatly increased his numbers this season as the team’s starting goalie, starting in 20 of 21 games and totalling 2,676 minutes. He posted a goals-against average (GAA) of 2.58, made 1,397 saves for a percentage of .924 and helped his team finish tied for third overall in the Minnesota Intercollegiate Athletic Conference (MIAC) standings. His 652 saves were the most of any goalie in the league this year, and he ranked in the top five in conference GAA and save percentage. Howe said there were games this season where Jacob “took over” and made things look easy in the net. Back on Oct. 28 Stephan set the stage for a big season in just the team’s second game of the year as he stopped 42 shots against Gustavus to record his first collegiate shutout. In the process he posted the second highest single game saves total in his career. Midway through the season, Stephan continued on a torrid pace in recording 33 saves against Hamline College to post his third shutout of the season and push his season record at that point to 6-1-1. Stephan also lowered his season goals-against average to 1.61 and upped his save percentage to 94.9%. At that time he led the conference in GAA, save percentage and wins and was tied for third in the nation in Division 3 in shutouts. Stephan was a 2019 MIAC Hockey Honorable Mention team member, being recognized as one of the top five goalies in the league.